You notice the dashed line that runs from top left to bottom right. All .500 teams would be on this line, if all bases gained were equal. The .500 teams that won abd lost their games 3-1 -- like Daddy-O's 1964 Dodgers (80-82) we presume -- would be very top left. The .500 teams that won and lost their games 13-9 -- like the 2010 Colorado Rockies, keyed by Miguel Olivo but also including Olivo's supporting cast, Tulowitzki, Helton, and Seth Smith, would be very bottom right. THT had the M's "neutralized" pitching as just about average, and their out conversion #4 in the league. In part, no doubt, due to Safeco. (1) Re-roll the dice for the 2016 season and the Seattle Mariners are clearly the best team in the AL West per this metric. Not the best team by a large margin, but the best team by a clear margin. a) Three teams that were well above average for both run scoring and run prevention. The division winners. b) Seattle, comfortably past the dashed line in all vectors. As they have been since 1977, pretty much. 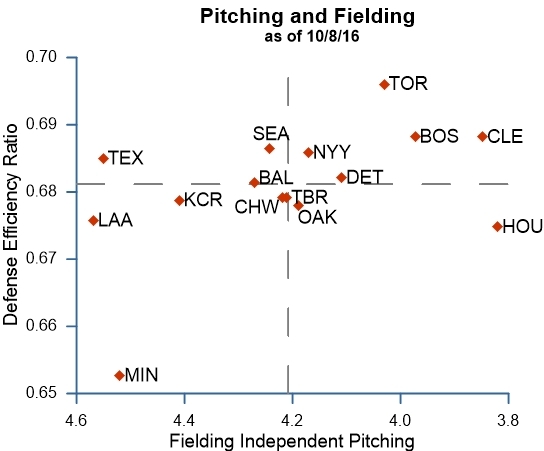 c) Four teams slightly past the dashed line - Bal, Det, Hou, and Tex. (3) DiPoto's "transition" season created an all-around "solid" team that finished 86-76. A couple of games short, but it beats 61-101. We broke a 15-year run of meaningless games in the last week of the season. DiPoto last winter said gracious things about almost everything, and he bent over backwards to avoid cleaning out Zduriencik's players the way that Jack Zduriencik made it such a point to clean out Bavasi's players. He did say a few things, though, about rotten spots in the woodwork that left him aghast. From Dr. D's standpoint, this included players left to their own devices in hitting and training, the inmates running the asylum, relievers selected for fastball velocity rather than for effectiveness, doghouses and petted favorites, lawyer intervention, and so forth. In one winter, DiPoto did indeed change all that. He's got his layering, he's got his culture, he's got his depth and his approach. He's got the minors being voted on for best in the bidness. This winter, he'll be "running downhill" or "throwing downhill" or whatever GM's do when they've got the booster rocket off the ground; hey, if Steve Raible doesn't know what it means to run downhill, I don't see why Dr. Detecto has to explain it in any great detail. Next step would logically be to address the top of the roster, to add impact to the depth. And that's what he's implied. Let's see a couple of those 3-for-1 blockbusters. I dunno that Taijuan and ? is out there for Corey Seager, but that's what we'd be thinkin'. What I'm curious about is whether there's commonalities that helped Bal, Det, Hou, Tex, NYY, KC and Cleveland outwin what you'd think they'd do from their chart position. I mean, aside from all being AL which is interesting in itself. Edit: Uhhh,scratch that. Just noticed the chart is only AL so of course the outliers are too. Not trying to pick a fight, honest! he bent over backwards to avoid cleaning out Zduriencik's players the way that Jack Zduriencik made it such a point to clean out Bavasi's players. Relying on my primitive math skills, I count a total of 51 players who appeared for the M's in 2015. Not saying this is a bad thing...only that maybe JD deserves more credit for the housecleaning he did. I think he was more talking about prospects. Zduriencik traded basically every single scouting asset (such as they were) that he inherited from Bavasi the first year he helmed the club...we didn't really see that with Dipoto, even though he made a boatload of moves and many of them involved prospects. Is how I took it. Some have been traded by Dipoto but Z quickly traded all 3 prospects that were left by Bavasi. Think Houston is the team to beat, Mariners/Texas slightly behind at around .500. Assuming no moves of course. Offseason will determine the best team on paper.